The lens is said to be aimed not only at outdoor photographers, but at astrophotographers in particular. The lens includes a space specifically designed for holding a heating device to prevent condensation, and a metallic frame structure, which more effectively transmits the heat of the device to the lens. These greatly improve the lens' operability when shooting under star-lit skies, says Pentax. 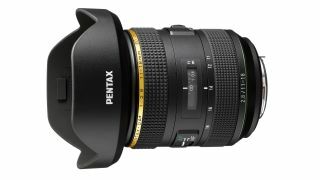 Pentax has simultaneously launched a new version of its 35mm f/2 prime.